T2/13655 Corporal Frederick Bates of the Royal Army Service Corps. Born in Hounslow in 1890. Died 22 October 1915 aged 25. He came to Axmouth to work as a shoeing smith and lodged in the village. 1196572 Gunner Harold Jonathan Beer of the 3rd Reserve Brigade, the Royal Horse Artillery. Son of the late Brian Beer and of Edna Beer (née Giles). Born in Axmouth in the September Quarter of 1892. Died 8 Axmouth 1919 aged 26. Buried in St Michael's Churchyard, Axmouth. 59165 Lance Corporal Edwin Real Bennett of the 1st Garrison Battalion, the Devonshire Regiment. Son of Thomas and Eliza Bennett (née Real); brother of Walter (see below). Born in Axmouth in the June Quarter of 1891. Died 15 April 1917 aged 26. 232636 Able Seaman Walter William Bennett of the Royal Navy, HMS Indefatigable. Son of Thomas and Eliza Bennett (née Real); brother of Edwin (see above). Born in Axmouth 12 April 1885. Died in the Battle of Jutland 31 May 1916 aged 31. 115761 Airman 3rd Class Reginald John Broom of the Royal Flying Corps, Reserve Depot. Son of John Bentley and Elizabeth Rogers Broom (née Salter). Born in Ottery St Mary in the June Quarter of 1882. Died 13 February 1918 aged 35. Buried in the cemetery of St Michael's, Honiton. 29328 Private Richard John Gapper of the 6th Battalion, the Duke of Cornwall's Light Infantry. Son of Richard and Mary Capper of Landslip Cottage, Rousdon. Born in Axmouth in the September Quarter of 1898. Died 16 October 1917 aged 19. 20016 Lance Corporal Henry John Bennett Humphrey of the 9th Battalion, the Devonshire Regiment. Son of William H and Sarah A Humphrey(s) of Stepps Terrace, Axmouth. Born in Axmouth in the December Quarter 1886. Died 1 July 1916 aged 29 on the first day of the Battle of the Somme. 192693 Leading Seaman John Love of the Royal Navy, HMS Vivid Shore Establishment. Son of Samuel and Alice Love of Axmouth; brother of Walter (see below). Born in Axmouth in the March Quarter of 1880. Died 15 January 1919 aged 38. Buried in St Michael's Churchyard, Axmouth. Not yet confirmed but believed to be John Love who was the son of George and Ellen Love. 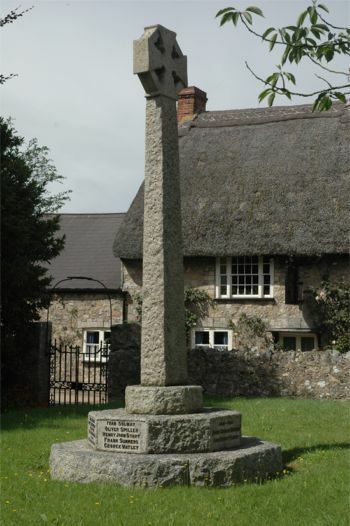 He was born in Chardstock but lived for a time with his grandparents Henry and Emma Wood of Axmouth. No Military information yet confirmed. 209960 Leading Seaman Walter Love of the Royal Navy, HMS Tornado. Son of Samuel and Alice Love of Axmouth; brother of John (see above). Born in Axmouth 20 April 1884. Died 23 December 1917 aged 33. 16906 Private Leonard Manley of the 9th Battalion, the Devonshire Regiment. Son of William and Phyllis Manley of Rousdon. Born in Chillington, Somerset, in the March Quarter of 1895. Died 1 July 1916 aged 21. Believed to be 18603 Private Frederick John Morgan of the 4th Battalion, the South Wales Borderers. Son of Frederick John and Eliza Morgan. Born in Axmouth in 1898. Died 15 November 1915 aged 17. Enlisted in Cardiff. P/5533 Acting Lance Corporal Thomas Moulding of the Corps of Military Police, Mounted Branch; formerly 190331 Royal Garrison Artillery. Son of James and Penelope Moulding. Born in Axminster in the March of 1891 (his twin died). Died 24 February 1919 at Truro. 8373 Private Robert Edgar ("Edgar") Northcott of the 1st Battalion, the Hampshire Regiment. Son of Samuel and Emily Northcott of Grinton Cottage, Rousdon. Born in Rousdon in the December Quarter of 1888. Died 8 July 1915 aged 26. 25825 Private William Perry of the 9th Battalion, the Devonshire Regiment. Son of Eliza Perry and stepson of George Haynes; husband of Ellen E Perry (née Beasley). Born in Axmouth in June 1884. Died 26 April 1917 aged 32. 25662 Private William John Sansom of the 9th Battalion, the King's Own (Royal Lancaster Regiment). Son of the late John Sansom and Elizabeth Sansom (née Matticks), later Mrs E Hill of School Lane, Rousdon. Born in Combpyne in the September Quarter of 1881. Died 19 September 1918 aged 37. 11483 Private Oliver Spiller of the 1st Battalion, the Devonshire Regiment. Son of Andrew George and Thirza Ann Spiller (née Tucker) of 52 Church Street, Axmouth. Born in Axmouth 24 July 1916 aged 19. Died 24 July 1916 aged 19. K37930 Stoker 2nd Class Henry John Start of the Royal Navy, HMS Vivid. Son of Henry and Ann Rebecca Start (née Haynes). Born in Colyford 26 December 1879. Died of illness at the Royal Navy Shore Establishment, Plymouth 11 April 1917 aged 40. Buried in Ford Park Cemetery, Plymouth. 103065 Private Frank Summers of the 118th Company, the Machine Gun Corps (Infantry). Son of Henry and Mary Summers of Dowlands Cottages, Rousdon. Born in Stockland in the September Quarter of 1897. Died 6 November 1917 aged 20. D/JX 155500 Able Seaman Harry Edward Morgan, Royal Navy, MS Matabele. 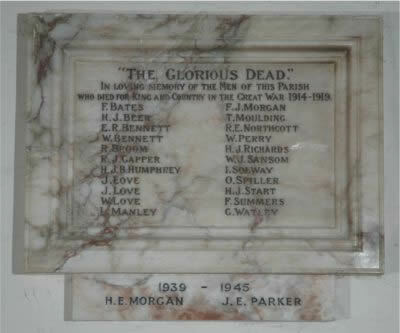 Son of Mrs A K Morgan of Axmouth. Born in Axmouth in the December Quarter of 1921. Died 17 January 1942 aged 20. 5620890 Private John Ernest Parker of the 8th Battalion, the Devonshire Regiment. Son of Arthur Thomas and Elizabeth Ellnen Parker. Born in the Honiton area in December 1915. Died 28 February 1940 aged 24. Buried in the churchyard at Axmouth.